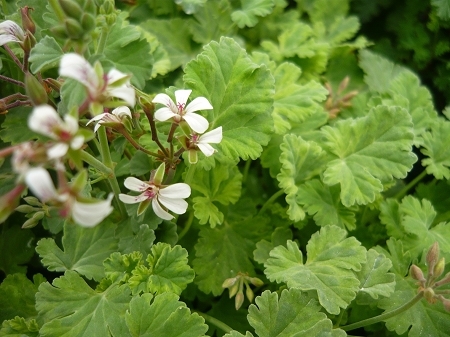 Golden Nutmeg Scented Geranium - Similar to regular nutmeg geranium in appearance and scent but leaves develop a wide yellow/gold border. Interesting and hard to find variety. Compact growth habit with sprays of small white flowers when in bloom, good container or hanging basket plant. Full sun, well drained soil. Perennial zone 10-11+ Live plant in 3 inch container.